The average school classroom is a challenging work environment by nature. And if you add climbing class sizes and mounting bureaucracy to the mix, you’ve got a work environment that’s more than challenging. It’s draining, stressful and unhealthy. It’s no surprise then that, according to a recent survey by the Guardian, 43 percent of England’s teachers plan to leave the teaching profession in the next five years. Working in schools is tough, even for those who love working with children. A teacher’s stress and anxiety doesn’t just impact their job performance and satisfaction. A recent study of over 400 school children by the University of British Columbia suggests that teacher burnout and student stress may be linked. Eva Oberle, the study’s lead author, says that stress is a ‘cyclical problem’ in the classroom, exacerbated by inadequate support for teachers and systemic issues in education. And while the study speaks to the experience of teachers and students in Canada, its findings have relevance in the United Kingdom too. So if you’re feeling burnt out and stressed, resolve to make a change for your own sake, and for your students’ sake. And don’t despair: there are many ways you can still work with children without being a teacher, and ways you can keep teaching outside of the classroom. Home education numbers have reportedly risen by 60 - 65 percent in recent years. More and more parents are choosing to educate their children at home, and many of them require the assistance of education professionals to supplement their in-home teaching. 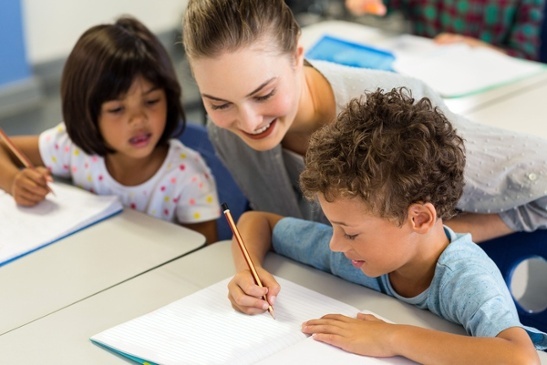 Contracting as a teacher for homeschooled children (or homebound children who, for various reasons, cannot attend a normal school) can be a lucrative and rewarding alternative to teaching in the classroom. You get to work directly with children with minimal distractions, and you have more freedom to choose how and what you teach. Keep delivering better outcomes for children, without the challenges of a normal school. What’s more, by setting up a learning centre of your own in partnership with a franchise, you can grow your own business using a successful established brand and model while doing what you enjoy. Other options include becoming an online tutor or a private tutor; opportunities abound you. Click here to learn more about pathways to tutoring and alternative careers in education. Some companies provide services and resources to schools, and they frequently hire qualified teachers. You could do anything from producing learning materials to developing teaching strategies and materials, or you could work in a consulting or training role. It’s an alternative to working in schools that will keep you in the education sector, and in a role where you can work towards real outcomes for children. Early years teachers (also known as nursery teachers) typically work with children up to the age of five years old. It’s a challenging job that requires patience and creativity, but it gives you the opportunity to have a positive impact on a young child’s development outside the traditional classroom. And if you think early years teachers are glorified babysitters, think again. The primary task of an early years teacher, according to the National Careers Service, is ‘supporting children’s development and learning through planned play, activities and tasks to build up their language literacy and numeracy skills.’ It’s an important job, and a rewarding one for people who love working with children. Teachers Pay Teachers (TpT) is a marketplace and a four million-strong community of educators who share, sell and create learning materials. If you’re a qualified teacher or a skilled professional who loves working with children, selling learning materials via TpT is a great alternative to working in the classroom. You get to join a global community of like-minded educators and create learning materials that you feel passionate about, and that other teachers can use. Moving on from the typical school classroom can be daunting, but it shouldn’t be. This is your chance to start doing something you love, in a place where you feel supported and empowered to make a difference. Give one of these career pathways a try, and leave a comment if you know of other alternatives to teaching for people who love working with children.